Hey Massi. Thanks for taking the time out to talk to me about the newest and last instalment of Christopher Nolan’s epic ‘Batman’ franchise, ‘The Dark Knight Rises’. What’s the general plotline surrounding this last instalment? Batman is struggling to find himself after being in the dark for eight years. He feels defeated but, he needs to do something about Bane, the new villain in town, taking over Gotham City with an army of mercenaries. I play a Janitor at the stock exchange in Gotham City. He does the cleaning everyday, but perhaps he might have something to hide. Watch the film and see what happens. Ha ha, you make it sound so easy and simple. I’m not a celebrity, I’m just blessed to be a working actor in Hollywood. I do not get “involved” with projects, I audition and eventually get cast, like I did with ‘The Dark Knight Rises’. If you have any films you would like me to get “involved” with, please don’t hesitate to let me know. The film stars Christian Bale, Gary Oldman, Tom Hardy, Joseph Gordon-Levitt, Anne Hathaway, Marion Cotillard, Morgan Freeman and Michael Caine – with Christopher Nolan onboard as director – what was it like working with the cast and crew on-set? Any good anecdotes? It was without doubt the best experience I’ve had in my career so far. The cast of this film is absolutely fantastic. Christian Bale I’m pretty sure is an alien and definitely not from this planet – his acting makes it look so easy and flawless, a real talent. Tom Hardy which I had most of my scenes with, is also an extraordinary actor, a lot of fun and a nice person to work with and I would say, quite playful – (we had a lot of fun on-set). As you probably know, I’m Italian and Tom is scheduled to play Al Capone in a future project and I’m looking forward to hopefully get the chance to work with him again on that. Now, Christopher Johnathan James Nolan, what a director! I really admire his way of working on set, he has his own way of doing things. For example, I didn’t see any chairs on the set, but why not!? Who needs a chair when we all need to be working, right? I agree with him 100%! I didn’t see any village or monitors for people to watch the playback. Who’d need to see the playback besides him? He has his own monitor tight around his neck, and is the only one that needs to see it anyways. I’m with him on that one too. Mr. Nolan also likes to give actors a little bit of freedom to be involved with the scenes and eventually share ideas. That time came for me and I was very proud to have given him an idea that later on was used in the final editing of the film. Let’s talk a bit about you Massi. What made you want to get into the industry in the first place? Well, when I was in Italy I was always the entertainer in the family, in my school and at the pizza place in my town. I eventually got around to charging people but I only charged money when the audience would laugh at my jokes of course and that explains why I’m so filthy rich now. Just kidding! I’ve always said, that the thing I enjoy the most in life is to make people smile. 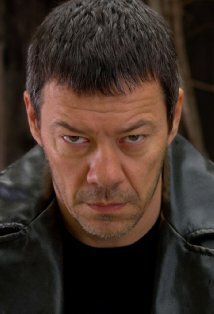 Here in Hollywood unfortunately there is not much to smile at because, I always play the bad guy and kill people. Nothing funny about that. Playing the villain is fun and I’m blessed to be working. Just be focused and know what you want. This job involves a lot of rejection you are going to hear the word NO so many times and between so many NO’s there will be some yeses here and there. Treasure those yeses and keep going. The ONLY way to fail is to give up! You are the one that will to do most of the work, don’t forget that ! You’ve been in a number of films and TV series – which actors/actresses have been your favorites to work with and why? Any good stories? Like I said before, Tom Hardy was so fun to work with. Tom Sizemore was also very fun and unique, I remember one scene where he scared an actor on-set improvising a scene with him that was not on the script, the shocked face of that actor was priceless. The gorgeous actress Lauren Holly also very fun to work with, but also what an amazing actress. Billy Bob Thornton fun and a very nice guy. Lindsay Lohan………………………………………………………………(you fill the dots, trust me anything you say will be good). Nice question, I actually had to ask my girlfriend if it was ok to answer Adele and she said yes, so yes I have Adele, but not before Michael Jackson. Dire Straits and funky music are out there too. Julio Cesar for sure, because I’ve always wanted to live in that era and be invited to his extravagant parties. Michael Jackson, because I want to ask him how he does certain dance moves. Also, Sir. Anthony Hopkins – I find him to be the most amazing actor in this planet. Now that we are ready to go to Mars we might need to find the best one for that planet too, perhaps could be Christian Bale as I said before. Oh cmon now, only three? Does the island come with a Sushi and Italian restaurant? Can’t live without sushi and pasta. A boat so I can go fishing. Music so I guess radio or I-Pod because it can’t be life without sound and music. Tools to build a mansion with an ocean view of course. I have two films for Lifetime that will air soon, one with Lindsay Lohan (November) and one with Lauren Holly that will air now in September (possibly the 22nd). Contract and dates to be confirmed, I should have a few films in store to shoot, one in Miami, one in Italy and one in Cambodia. Let’s keep our fingers crossed. Previous Dean Armstrong – (Wrong Turn 4 – 2011). Next Jodi Sadowsky – (Chained – 2012). Great interview, Massi! Love your sense of humor! Massi! Nicely done bud. It was a very good feeling to see u in the film. Hope to see more of you.